Some vehicles helpfully have phone numbers printed on them making it easier to feed information about poor parking back to the employer. 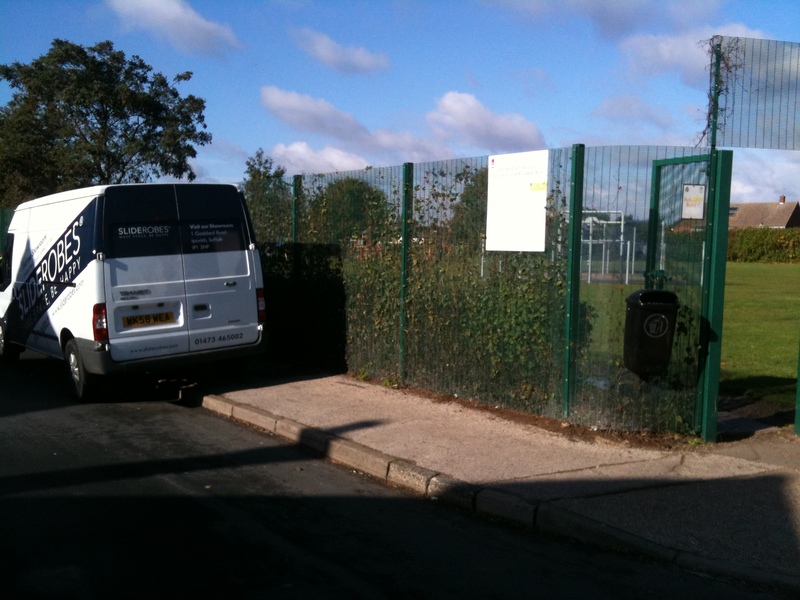 Today I passed a van belonging to Sliderobes parked in a stunningly inconsiderate place right outside a kid’s playground on a sunny Autumn Sunday afternoon leaving a 900mm gap between the wing-mirror and the fence. I contacted the company by phone, asking them to get the driver to move it to one of the free parking places on the road. After a bit of discussion where the driver was trying to convince me that it wasn’t obstructing anyone he moved it. 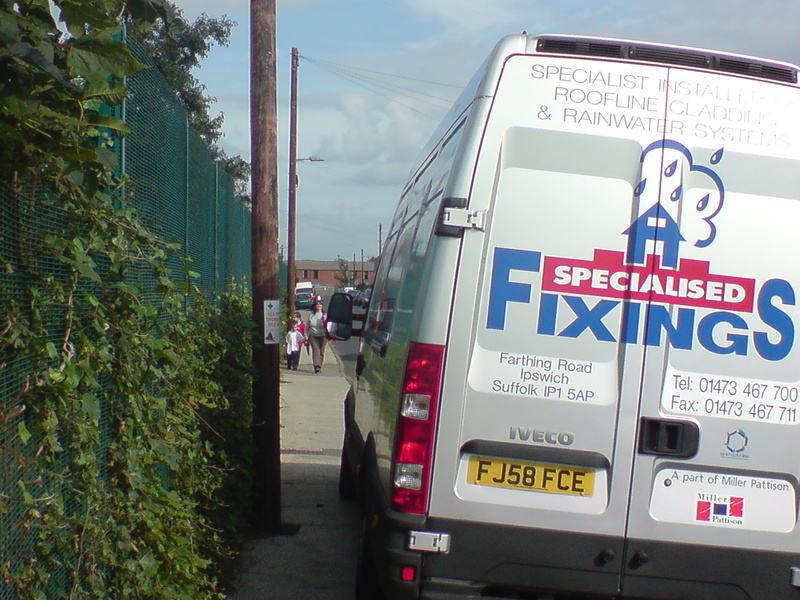 Sometimes to takes two phone calls – this van from Specialised Fixings made a speciality of parking on the same stretch of pavement. I phoned the company to complain and didn’t see it on the pavement for a couple of weeks. When it returned I complained again and I haven’t seen it on the pavement since. 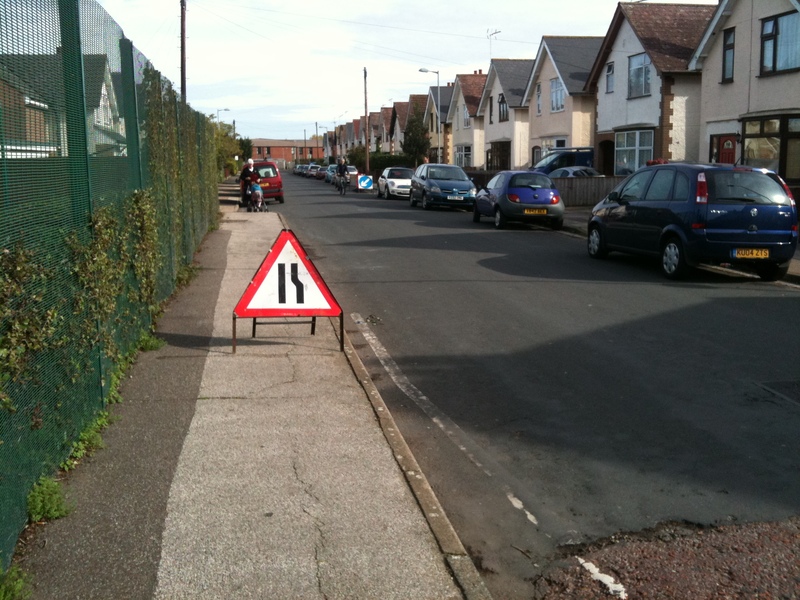 Of course it is not only vehicles that create obstructions on this section of pavement. Last week I did a blog post about these ‘obstruction’ signs for road-works that were left obstructing the same section of pavement. I have just seen the comment left on this post by Sliderobes themselves apologising. Not sure it the message is from head-office or from the Ipswich franchise. Whichever it is, the message seems to have got through this time which is good. We wanted to get back to you to extend our apologies! You are totally right- bad parking on our part. Thanks for bringing to our attention and we’ll be reminding our teams of the need to park considerately.